I`ve been here now for almost 2,5 weeks, and time really flies. I`m having the best time, India is such a beautiful country. After a short tour, I headed down to Bangalore, down south of India. There I met all of the people I`m volunteering with [at 40K] and we went to our respective villages. I live in a village called Dasajakenahalli, in a tiny apartment shared between 6 people. I have to squat to go to the toilet and use a bucket as a shower. So far it`s been surprisingly easy to deal with and I am very happy with my roommates. The food here is super yummy, and I will most likely be rolling out of this country because of all the curry. I can usually handle the spices, but there has been a couple of times where I`ve struggled. As most of you know by now, I`m working part time in what is called PLUS Pod. 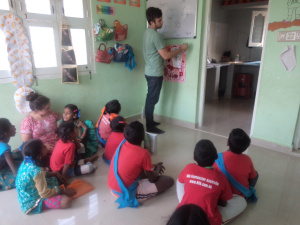 This is an after school program that runs every day for two hours (one hour for the younger kids, one hour for the older), which the organisation I`m working with; 40K, has designed. When I sit down with the children to help them with their homework, I understand how much they need this alternative! The school system is really bad, and they are not taught much! Especially girls are overlooked by both teachers and parents because their education is not as highly valued. With PLUS Pods’ help they have the opportunity to break out of poverty, and I`m so proud to be a part of this! The kids are adorable, and they are always so happy when they see us. Yesterday we were invited over to one of the oldest boys`house for tea, and he was really proud to show us his house and his family. The kids run up to us when they see us on the street, and wave to us from the bus. I have to admit I`ve got a few favorites, but it`s hard not to love them all. 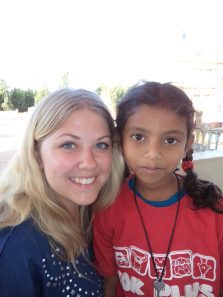 This is an excerpt from the personal blog of Mette who travelled to India with the 40K Globe program in February 2014. You can read more about her experiences in India at her blog here. Previous Post Previous post: Jumbo! Final weeks in Kenya!